I really need to do these things more often, my backlog is getting huge again. So hey, let’s start this thing. 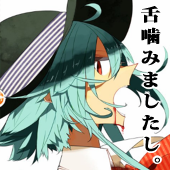 As always, err on the side of NSFW-related caution and click on the header image to get to the artist’s pixiv page! I am a massive, massive sucker for a few things. First, alternate character designs (Tenshi with short hair, for instance); the second one is backgrounds. If you can do a good background, you are my favorite person. Thankfully, Siirakannu does all of this and more. Her character artwork has a unique, sketchy style that I’ve never seen before and her backgrounds are absolutely gorgeous and I have an unhealthy amount of her art in my wallpapers folder. I would normally spend some time talking about some of their works, but there’s one really, really excellent piece I’d like to focus on: Tenco’s Story. This was what originally drew me to Siirakannu in the first place. Now, I highly recommend you check it out while reading this, because I’ll be referring to it a lot. Page nineteen in that set was the first of Siirakannu’s work I’d ever seen and it just had me captivated for a good while, it’s easily my favorite thing she’s done. I also love that there’s so much personality coming through a mostly-silent story (and even if it wasn’t mostly silent, I can’t read Japanese worth a damn). Siirakannu’s crafted this amazing, beautiful world and I really hope we get to see more of it. I think my best way of putting how this feels to me is… very Ghibli-esque. The sense of creature scale (like the giant frog on page fifteen) reminds me of Nausicaa or Totoro and the massive, awe-inspiring landscapes make me want to watch Castle in the Sky. There are a few other ‘this is familiar’ feelings I’m getting, but I just can’t remember them. Ghibli is definitely the most outstanding one, anyway. Unfortunately, there’s not a huge lot of stuff I can say about her work that’s not ‘This is absolutely beautiful and more people need to know about it.’ So, yeah. Just go check her work out and if you like it well enough, go ahead and favorite her and rate some of her stuff or follow her on Twitter or something. I’ll be back tomorrow with the next feature in my Kirby series retrospective: Kirby’s Adventure. As always, thanks for reading and have a good’un. This entry was posted in Spotlight, Touhou, Video Games and tagged short-haired tenshi hinanawi, tenco's story, touhou pixiv art, touhou tenshi. Bookmark the permalink. But I saw Tenco’s Story too. quite excellent.. If Gensokyoutoumen… (Yeah I forgot his name.) is the god of city designs, Siirakannu is god of background designs. Landscape art isn’t appreciated as much as straight up portraits and so on, but it’s still a masterwork as how much grand it looks and so on. Love the other game references, such as Monster Hunter and Pokemon. A tiny bit too much, but still very nice to look at. That name sounds incredibly familiar… (Gensokyoutoumen, not the other gent who drew the depressingly brutal Hatate). Is he the dude who did that manga thing about an old postman in modern day Gensokyo or something? And assuming the Koutamii comment is correcting my name: Thanks! I’m just going off what I find on danbooru because, well, I can’t read the language worth balls. Seconding the third paragraph in its entirety. I would kill to see more of her work with such a scale. I would also kill to see her do world creating for an anime or game or something. Even if she’s just on concept art, it would be gold. And I only noticed the references now that you mentioned it, to be perfectly honest. Yes, the epic artist… Literally created a world. Oh, sorry for that, should have said something about that, right.. Well he doesn’t do that most of the time. I was just commenting how the colouring is kinda similar to Koutamii, it’s very… uh, Wet? I agree.. There are many many people I want creating either a anime of their work or creating a game design. For example, I’d really love if Mitsumoto created a whole manga of either Original couple or just sticking with MokoMys. Oh and more children’s books from karaagetarou. lol. I would give my left kidney for more romance from Mitsumoto. And yeah, I noticed that while looking through his stuff! Thanks for the comments, by the way!